Laurie, am I on ignore? Hello, hello. No wonder you never gave me your new cell number. I hope my last post in this thread wasn't upsetting! I didn't mean to upset anyone - I am just curious as to who Dr. Tim Tristan is. I am interested to hear so I know what I have to look forward to at the SGGA. I am REALLY looking forward to it and am happy that wonderful people like you are here to make this amazing event happen!!! Ashley, I think you got lost in my sillyness. 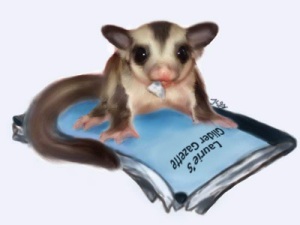 I don't have his information in front of me but he is a vet from TX that has worked a lot with sugar gliders. Maybe someone else will come along soon. I am handicapped to my phone right now. TwoDay87 wrote: I hope my last post in this thread wasn't upsetting! I didn't mean to upset anyone - I am just curious as to who Dr. Tim Tristan is. I am interested to hear so I know what I have to look forward to at the SGGA. I am REALLY looking forward to it and am happy that wonderful people like you are here to make this amazing event happen!!! He use to be Peggy's (Srlb) vet. He has helped her a LOT with sugar gliders and people in the surrounding area. He was also willing to help me when I needed it for my apartment. I've heard him speak and he sounds like a very knowledgeable gentleman. I dont think your post was upsetting. Just got lost :) and we were all newbies once. Alicia, just go get the keylime pie on a stick and you'll be all better! Keylime pie on a stick!?!?! Heaven!!! Laura, we are NOT moving it to Texas, we are moving it to Minnesota, because Alicia already promised me while she was on her smoke break and I slipped her unmentionables that the SGGA was being moved to Minnesota, after all everyone wants to visit MN anyway - we have MOA, what does Texas have hmm? We have trees! All texas has is DIRT. So stop trying to manipulate situations. I am so stinking excited for the SGGA even if I cant have a raffle for free and I have to pay to attend, and how come the shirts arent ready yet? all MN has is bad nasal accents and a bunch of caca weather. and if you think all we have down here is dirt, your pregnant brain is obviously messing with you. muck you! Lol! Bring it to MN!!! Please!!! ALICIA! Step AWAY from the Blackberry! Rum, party, Steve, FUN!!! We'll still be here biotching when you get back girl. Laurie if that is your cell im going to be so mad I had to get it this way!!! it's probably some mental health line she is sending me to. » Do police at Guadalajara Airport speak English?